I am in the process of fact-checking the ‘IMF Staff Discussion Note on Virtual Currencies‘. Only 14 pages into it there are already strange and pretty obvious factual shortcomings. So far, the most blatant one is that the International Monetary Fund characterizes the ‘Cost of Production’ for bitcoin (lowercase for the “currency”!) 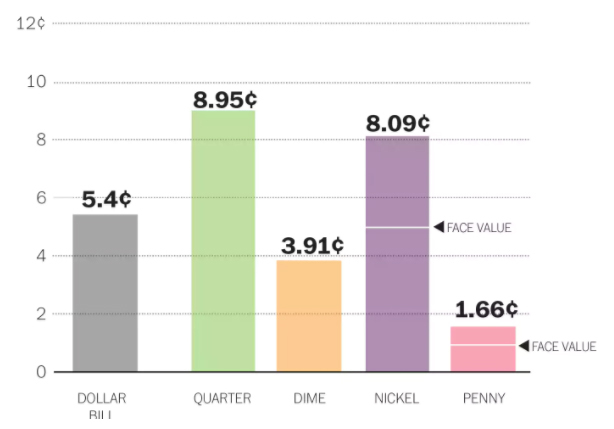 as high while assigning the value ‘low’ to the US Dollar’s production cost. Needless to say, this is an oversimplification but also hints at the fact that the researchers did not actually get into the math of the matter which would seem like an important fact when dealing with “money”. Current bitcoin production cost can be calculated here. As everybody familiar with the matter knows: Bitcoins are being ‘mined’ by individuals for a profit – so there’s an actual marketplace for it. And, these miners also mine transactions – actually mostly, by now. 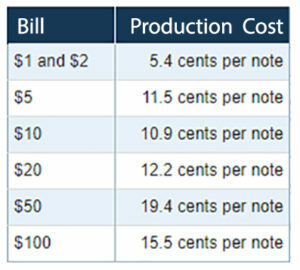 Below are the production costs for US Dollar bills and coins as provided by the “Federal Reserve Bank“. Of course these numbers do not account for driving these things around town in armored cars or the fact the JPMorgan alone employs 250,000 people (I assume they all use computers – not sure though). It should be easy to see that not a single miner would ever consider turning on his rig for such a poultry outcome.